SAN DIEGO, California, January 31, 2011 (ENS) – San Diego Mayor Jerry Sanders Monday rolled out Smart City San Diego, a broad public-private collaboration that aims to improve the region’s energy independence, empower consumers to adopt electric vehicles, reduce greenhouse gas emissions and drive economic growth. Smart City San Diego partners are the City of San Diego, San Diego Gas & Electric, GE, the University of California San Diego and CleanTECH San Diego, a nonprofit organization that includes business and financial leaders, academic and research institutes, government agencies and other nonprofits. “With the San Diego region currently preparing for one of the largest initial deployments of electric vehicles in the country, the first priority for Smart City San Diego is to expand current projects to implement a comprehensive electric vehicle infrastructure,” said Mayor Sanders. “This is the first of many initiatives that our partners throughout the region will undertake to make San Diego the foremost resource-conscious community in the United States,” the mayor said. Electric vehicles offer tremendous benefits to consumers and the city while posing significant challenges, the mayor said. While electric vehicles could reduce U.S. oil importation by 52 percent, and electricity costs per mile are calculated at one-quarter to one-third the cost of gasoline, there are obstacles to overcome. Grid reliability, consumer impact, public charging and alternative fuel options are some of the issues Smart City San Diego intends to address as part of a comprehensive plan to bring more efficient, reliable and sustainable energy to everyday living. GE is involved through its charging station, the GE WattStation, which charges vehicles quickly and uses smart grid technology that allows utility companies to manage the impact EVs have on the local and regional electric grids. To streamline EV charging, UC San Diego, San Diego Gas & Electric and GE will demonstrate smart technologies to identify when and where charging will occur, and work with electric vehicle owners to better manage charging loads. To ensure easy and rapid deployment of electric vehicle chargers for both home and public-access locations, San Diego Gas & Electric and the City of San Diego will develop an efficient electric vehicle permitting process. To test the technical and economic feasibility of achieving zero tailpipe emissions, UC San Diego, GE and San Diego Gas & Electric will use UC San Diego’s solar and fuel cell renewable energy generation infrastructure. 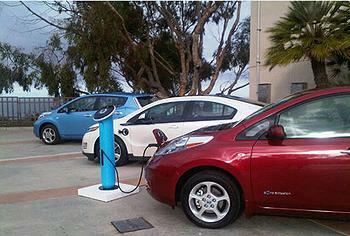 CleanTECH San Diego will link anticipated technology needs in the electric vehicle sector and innovators in the region. To quantify the economic impacts of the electric vehicle initiatives, such as cluster growth, incremental job growth and training needs, CleanTECH San Diego and the City of San Diego will collaborate. The collaborators plan to enlist a consumer focus group of 50 UC San Diego students, faculty, and staff who will be offered commercial leases on electric vehicles, charging their vehicles through UC San Diego’s planned electric vehicle infrastructure. “UC San Diego is committed to working with our partners to develop and demonstrate innovations that will enable carbon-free transportation,” said Marye Anne Fox, the university’s chancellor.